Today's Orange County "mystery photo" seems like it should be easy to identify. But all I know is that it hails from November 1964 and that it originally came from the County Planning Dept. Perhaps you'll recognize the spot or at least have some educated guesses. The folks at John Wayne Airport tell me that Martin Aviation will open an aviation museum on the west side of the airfield in August. Does anyone out there know more about this? The Santa Ana History Room at the Santa Ana Public Library has a new guy at the helm: John Elliott. Actually, he's been in charge of the collection for several months (and has worked at SAPL for much longer), but I only got the chance to meet him today. He seems extremely well-suited to the job, and I think he'll be a great asset to the local historical community. Welcome to the wonderful world of O.C. history, John! The photo is of Ponyland in Irvine park, operated under contract by Hart Livestock (owned by Donna and Slim Hart). The ranch was located just off the freeway in Anaheim Hills, near Gypsum Canyon Road, between the freeway and the river. 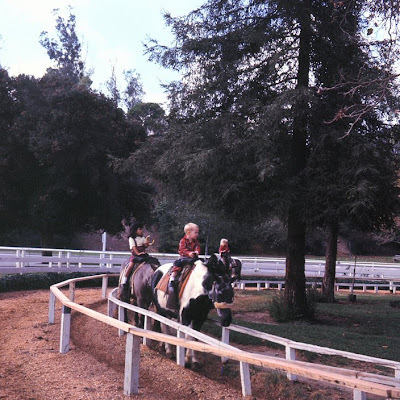 They also operated Country Trails, for adults, in the Park. They also would contract out the pony's for birthday parties, and would truck them to your site. I believe it's still in operation, but do not know the owners. Thanks for the information! I'm ashamed to admit I haven't spent much time at Irvine Park. It's one of those areas of O.C. that I'd like to get to know better. Looks like Irvine Park to me. As soon I saw the photo childhood memories of pony rides Irvine park flooded in. The Harts still own Hart Ranch off Green River Road, (off 91 fwy). Not only do they supply horses to camps, riding programs but many people think they still send horses to slaughter! I have seen photos taken there during the last couple of months of horses with strangles, extremely underweight, injuries untreated. These poor horses have no shelter from the sun. Very sad for the horses that have to live in these conditions. Santa Ana, William Spurgeon, Floral Park, etc. Beans, Glenn Martin, Fullerton Fire Dept, etc. Calico Mine Ride, Bud Hurlbut, RSM, grants, etc.